A new report by the European Academies’ Science Advisory Council on genome editing gives advice to European policy-makers on groundbreaking research involving genome editing and plants, animals, microbes and patients. 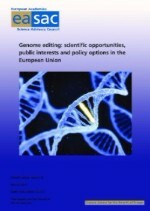 In this report, “Genome Editing: Scientific opportunities, public interests, and policy options in the EU”, EASAC emphasises that policy-makers must ensure that the regulation of applications is evidence-based, takes into account likely benefits as well as hypothetical risks, and is proportionate and sufficiently flexible to cope with future advances in the science. Present knowledge gaps and uncertainties mean that more basic research will be necessary. EASAC expects that research advances will fill many of the current knowledge gaps and that progressive refinement of genome editing tools will further increase their efficiency and specificity, thereby reducing off-target effects. EASAC anticipates that the fast pace of change in research and innovation will continue. EASAC’s new report addresses several areas in which genome editing occurs, including plants, animals, micro-organisms, human cell genome editing as well as gene drive applications for vector control. EASAC also makes recommendations regarding cross-cutting issues, including engaging with the public. As genome editing pertains to animals, livestock breeding in agriculture should also be governed by the same principle as proposed for plant breeding – to regulate the trait rather than the technology and be open and explicit about what is being done.